As our stay in Annecy came to an end, we decided to visit the city at night fall. 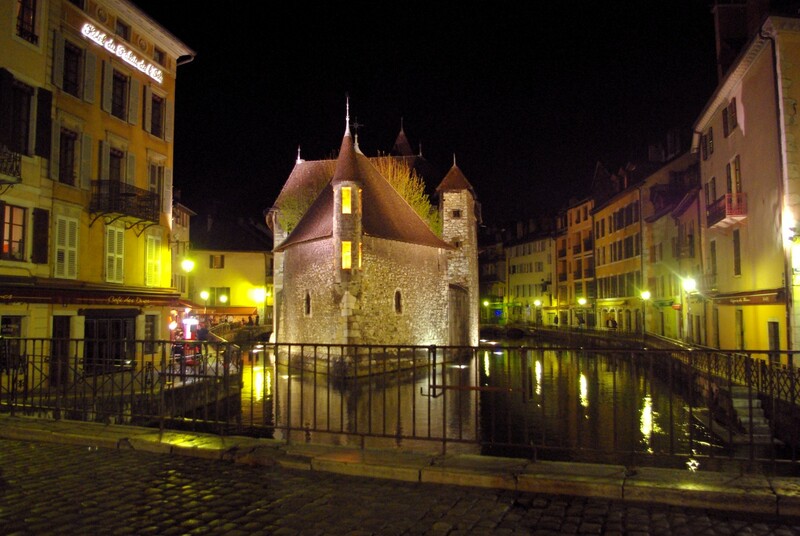 Here is a series of photos of Annecy by night. Most of them centred around the beautiful Palais de l’Île. Just before the night fall, the Pont des Amours is glowing in the setting sun. The Town-Hall of Annecy is adorned in light. The picturesque district of the Little Venice as seen from the Pont de la Halle. In the centre lies the Palais de l’Île and to the right, the church of St. François de Saales. The Palais de l’Isle and Perrière Bridge. The view of the Little Venice district from the Perrière Bridge. The restaurants which border the quays in the Little Venice district of Annecy. The Palais de l’Isle viewed from the square of St. François de Saales. The rear of Palais de l’Isle viewed from Quai de l’Île. The Palais de l’Isle (left) and the white façade of St. François de Saales Church. Photo taken from Quai des Vieilles Prisons, Annecy. Next Article Who brings the Easter eggs in France?